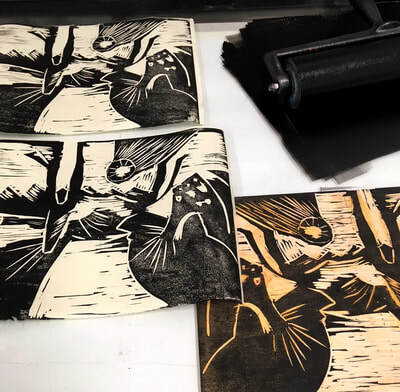 Whether you are new to printmaking or are seeking to expand your skills, Print Lab Australia offers a comprehensive range of professional printmaking workshops for all levels of experience. Our objective is to make quality printmaking workshops accessible for people living in and around the Perth Metro Area. To this end, we run workshops from a range of locations around Perth to meet the needs of the community, including Midland, Perth CBD, Melville and Mandurah to name a few. Keep an eye out for individual workshop details promoted via our website, Facebook and Instagram. Please see below for descriptions of workshops we run on a regular basis. If you have a particular interest in a process that is not listed here, please feel free to contact us with your query. Where possible, we are more than happy to tailor a workshop to your needs and interests. Monotype is the most painterly form of printmaking. 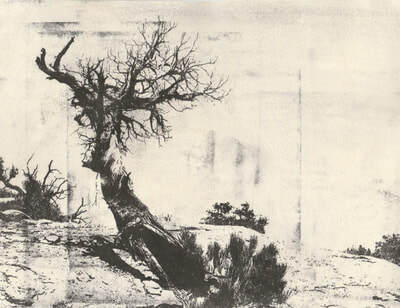 This technique involves drawing or painting with ink on a smooth surface. The image is then transferred to paper using a press. 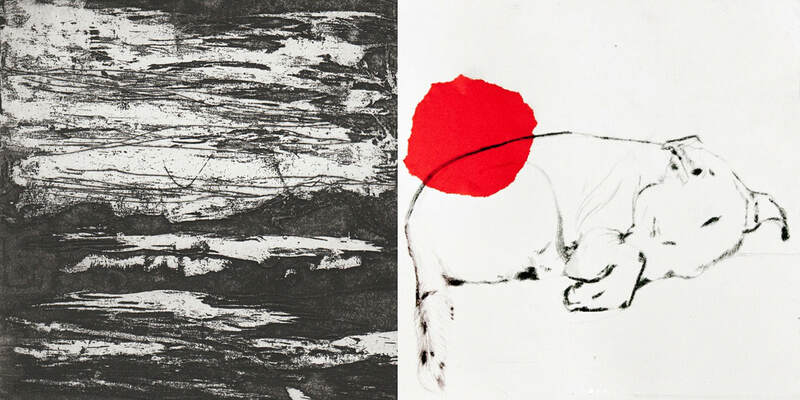 Monotypes offer a range of unique textures, rich tones, marks and patterns. The resulting image is one of a kind, and cannot be repeated. It is a perfect medium for beginners as well as more advanced printmakers and is an excellent skill to add to your repertoire. 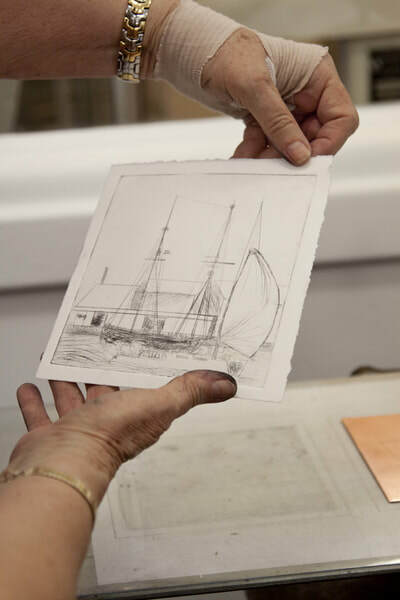 ​Drypoint is an intaglio process that is closely linked to drawing. Using a sharp engraving tool, you will learn to incise your copperplate with hand-drawn lines, and employ cross-hatching techniques to convey tonal variation. The results of this process range from extremely fine to robust, velvety lines and tones. 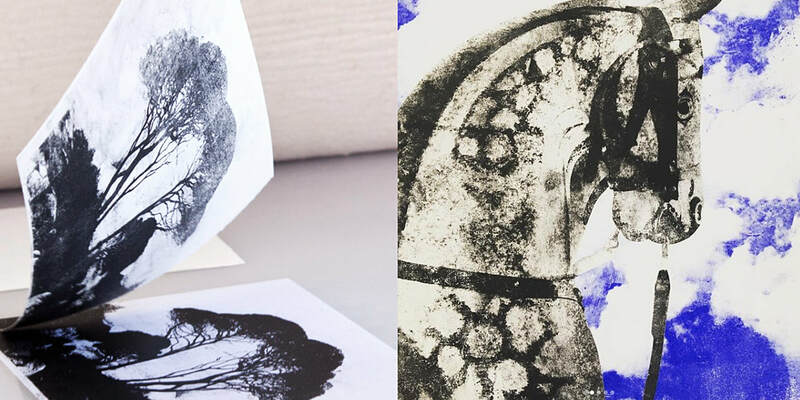 Paper lithography is an exciting, simple and non-toxic way to create monoprints or to add photographic elements to your existing prints. In this process a black and white photocopy is used as a plate (matrix) which is then inked and printed through the etching press. Wood lithography (mokulito) is a form of printmaking based on principles of lithography (grease and water cannot mix/grease repels water) using wood ply as a printing matrix instead of limestone. This technique was developed by professor Seishi Ozaku, in Japan in the 1970’s. Professor Josef Budka and his daughter Ewa have recently realized further development of the process in Poland.In this workshop, you will learn how to prepare the wood to create and print an image. The image can be added to, subtracted from, and carved into. It is an easy and chemical free method of lithography that allows you to create multicolor prints. Woodcut This form of relief printing is one of the most accessible as everything can be done by hand, with no press required. The nature of woodcut means artists can employ various tools to make a variety of marks, achieving very fine details, and delicate lines through to bold shapes and colour blocks. This hands-on workshop will provide an overview of one of the oldest relief printing techniques. You will learn how to select the right wood, prepare a surface for carving, carve your block, and produce multicoloured prints for your edition. Linocut is a versatile and straightforward relief process, where an image is transferred onto paper using a hand-burnishing technique or a press. Designs ranging from graphic and gestural to fine and delicate are cut into a linoleum plate with specialised tools. Bold single colour prints can be achieved, or you can experiment with a subtle interplay of layers and opacities in a multi-plate method. Collagraphy is a printmaking process in which materials are applied to a rigid surface such as paperboard or wood. A range of tools are used to create multidimensional plates. Ink is applied to the plates and it is then printed onto paper using an etching press. You can experiment with different tonal effects and colours, as well as embossing, textures and shapes.